I found my tutor feedback for Assignment 5 very encouraging. I was especially interested in the comments about composition and the balance of positive and negative space reflecting the balance of the figure on the edge of the sofa. I had not articulated this to myself but I think in playing around with the composition of this work I was drawn to a composition which reflected this balance. My tutor also commented that I hadn’t reflected on how other artists had informed my work. This was an omission on my part. I was strongly influenced by Elizabeth Peyton’s composition. I suddenly noticed during this assignment Peyton’s amazing use of composition and colour. Her figures are usually cropped in interesting ways. I intend to look at Peyton’s drawings again, breaking down her work into areas to inform my own approach to composition. Use gallery visits more effectively to feed into my own practice. Using sketches, note-taking, reflection. Look at Degas’ monotypes and combination of mono / pastel / charcoal. Thank you for the care taken in preparing and organising your portfolio. One A5 sketchbook; five pages, A4 sketchbook; 8 pages (son). A3 sketchbook; five pages (self-portraits). The log was available and up to date. I will comment upon specific aspects under the key headings. You utilised a broad range of dry and wet media within the preliminary stages and final outcome. An interesting and inventive approach to composition, informed by experimentation and use of photographic methods (cropping-in). This shows confidence in your understanding and application of compositional devices. An interesting and personal inquiry into your son and the ‘enigma of childhood’. You explored this through a process of drawing, reflecting, visual and critical inquiry. Good use of research in terms of the figure, and specifically referencing photography as a resource, drawing upon a diversity of sources. With regard to your emailed selection for assessment. We can discuss this via Hangout on Wednesday 6th at 5.30pm. Do refer back to the assessment criteria and Guidance for Assessment on editing and selecting. It is important that you consider what you feel is your best work (not necessarily evidence from each assignment). In your sketchbook and the preliminary pastels you challenge yourself by experimenting with a variety of possible compositions. These include some intensive cropping of your son tumbling. In relation to when you began the course, this reflects well on your learning, understanding and confidence. On a pragmatic level; I get a sense that you have struggled at times, to set yourself a plan of progression and timescale, that supports you in fully experimenting with your range of visual language and mark-making. In future it would be acceptable and beneficial to use similar format / structure to the assignment, which you felt worked best. There is something arresting and interesting in the bold composition of the final A1 drawing. It seems to reflect the notion of your son’s ‘absorption in his world / activity’ and what you described as your exclusion from his. What is interesting is that the peculiar cropping, intrigues the viewer, I found this worked best when looking at the drawing vertically and from a distance of around 6’. With regard to the composition, you don’t specifically mention any influences, yet I wonder if subconsciously the Saville’s have informed you here? You refer to creating a sense of ‘intimacy’ in the composition, which I would agree with, whilst also in contradiction excludes, with his back to us. Exploration of qualities of movement using charcoal, masking fluid, hard and soft pencils. Experimentation with composition regarding tumbling son. Noticing the potential dynamic of the diagonal figure cutting across the picture plane. There’s a strong sense of weight, gravity and energy to these compositions; pencil with warm pastel and 138 opposite. Here you portray a spontaneous, energetic play and shifting limbs and feet. Testing-out of cropping devices to explore more abstract elements in the frame, brings an ambiguity to the scene. An interesting experiment, especially in relation to your thoughts on the enigma of childhood and your son being ‘in his world’. There is something you have intuited here, that is very interesting, about the ability of children to be completely absorbed in their own body, mind and space. A broad and diverse range of artists referred to on your log. You researched across a range of secondary source material; books, blogs and articles (well Harvard referenced). Your research on Mullins triggered some interesting thoughts regarding the utilisation (and validity) of photography in art practice. You make a distinctive point regarding your intention to explore not only your son, yet specific aspects of childhood, within the context of the assignment. This is an interesting perspective and given more time would be worth you exploring further. It is clear that your aims, intentions and focus shifted; as you worked on the assignment. This in turn has affected the outcome which has an ambiguity that is very interesting and less literal than your previous drawing at assn. 4. You started off by focussing solely on drawing a sense of movement in your son’s limbs, this led to broader concerns regarding; the enigma of childhood and your evolving relationship with your son. These are rich avenues of inquiry which I hope you will develop further in the future. Your research references both primary and secondary sources with good breadth and diversity. Good use of Harvard referencing.. Your sense of questioning; of what you are doing, thinking and researching has been a useful, purposeful and sound practice throughout the unit. Do continue to draw on and practice this as you progress. Degas’ monotypes and combination of mono / pastel / charcoal. Francis Alys Layered, taped, tracing paper drawings. Sally Mann Interesting in relation to the controversial use of / ‘manipulation’ of portrayal of her children. More exploration in your sketchbook or on loose sheets at the prep stage would help you to expand on your visual language by drawing upon a wider range of mark-making and qualities of line- in relation to your aims. Explore a sense of weight, balance, harmony / disharmony in the shifting of negative and positive space, as well as the cropping-in devices of composition. 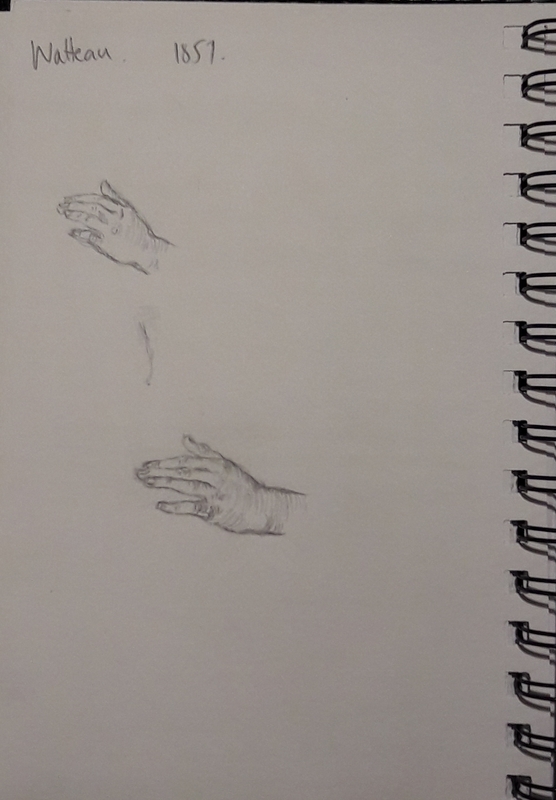 Try and re-draw the wrist, hand and shoulders, first review the drawing in a mirror. Do some small studies on loose paper. Then redraw in the final pastel drawing. ((!)) Each time you research: primary and secondary sources; ask yourself what you understand from the text / image / experience and what you might draw upon and utilise to feed back into your own work. This was a fantastic opportunity to see drawings by artists such as Antoine Watteau, Kathe Kollwitz, Rembrandt, Michelangelo and Bridget Riley. We discussed how looking at artists’ drawings allowed us to see the process of making art and how artists use drawing to work out their ideas on composition and tone. We spent some time copying work – drawing the drawings. 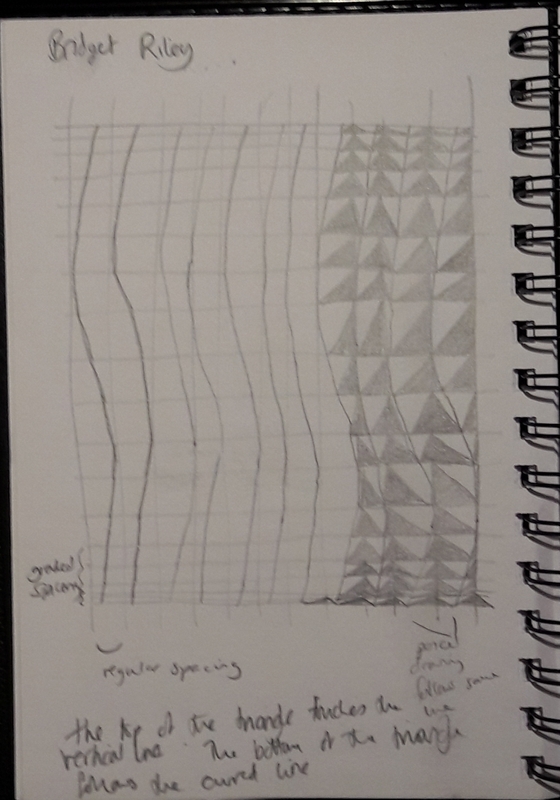 Focusing in detail on a drawing by Bridget Riley, I looked at the way the artist formed her shifting shapes through minute changes in the shape and direction of lines. Creating a simple but intriguing pattern and the optical illusion of movement for which she is famous. I also spent some time drawing a tiny hand after Watteau. The original was tiny and detailed. It was a good thing there were magnifying glasses available. My drawing was also tiny but it would be interesting to draw it to a large scale using a projector or scaling up. Sarah Jaffrey is the British Museum Project Officer for the Bridget Riley Art Foundation. The project aims to encourage students to spend time looking at the drawings of artists from old masters to contemporary artists. It grew out of Bridget Riley’s own experiences of looking at drawing as a student and working artist and her concern that modern students were not being exposed to the opportunities she had. Sarah introduced the drawings we were looking at and we had a discussion about how the artists were using drawing to explore ideas about composition. I hadn’t considered this distinction before and was very struck by it in the context with which I was working. I was drawing my son but I don’t think I was trying to produce a portrait of him. Instead I was trying to capture something more general about childhood. The book also tackles the issue of using photographs as a basis for painting. ‘Photographs are a vital tool for twenty-first-century artists. Photography is no longer seen as the assassin of painting, as Delaroche and others initially feared it would be, but as an accomplice to painting’s continued existence.’ (Mullins, 2006:16) For many of the artists featured, photographs are an essential part of the process of making their art including Chuck Close, Elizabeth Peyton, Peter Doig, Gerhart Richter, Rui Matsunaga and others. Many select generic images from magazines, newspapers and other mass media as a basis for creating a whole new world or of commenting on our world as it is now. Covering established contemporary artists, the book introduced me to many artists I hadn’t seen before and whose work I was drawn to including Henning Kles whose rich and mysterious paintings Mullins describes as ‘Whistleresque’ and I find have echoes of Peter Doig. Also, Hernan Bas whose paintings resonate with Elizabeth Peyton and according to Mullins are largely autobiographical while again being richly coloured and beautiful to look at. Anna Bjerger produces expressionistic paintings based on her own and found photographs while Mika Kato produces meticulous paintings of doll-like figures, each with a tiny flaw. Beautiful and deeply creepy. Once again, I find the artists I am drawn to produce work that is beautiful, richly-coloured and sometimes very detailed, but also unsettling and strange. I’d definitely recommend this book which looks at a wide range of contemporary artists who use the figure. Mullin’s introduction is an excellent overview of artistic approaches to the figure. A day trip to London and I chose to look at some of the free exhibitions at Tate Modern and to visit the Basquiat exhibition at the Barbican. At Tate Modern I enjoyed an exhibition on artists’ working practices. I would have liked there to be far more information but it was great to see some pictures I had researched in real life. 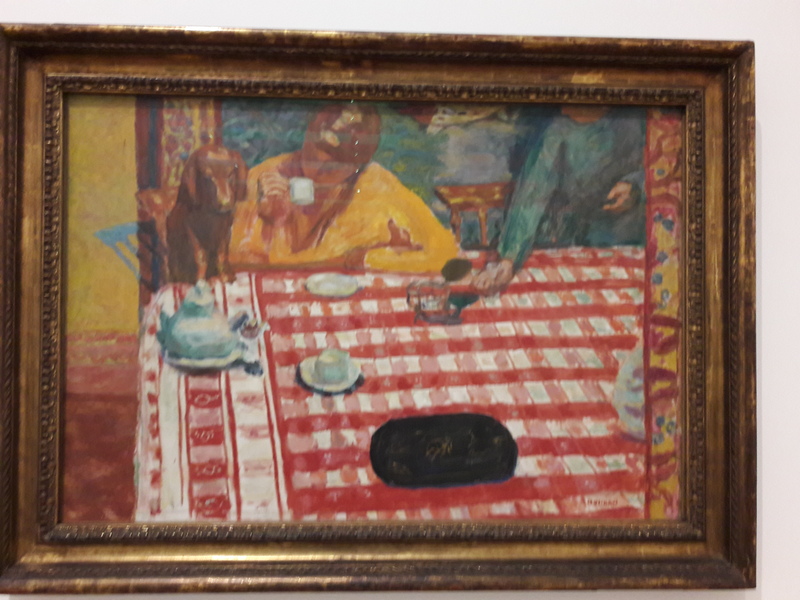 A painting by Bonnard that I looked at for Part 2 was paired with some preliminary sketches and there was also a Morandi painting which I had looked at during Part 1. There was an interesting room full of photographs and videos of artists in their studios which I enjoyed. I always like seeing videos of artists working on YouTube. Basquiat at the Barbican in ‘Boom for Real’ was a fascinating insight into a unique artist. Again, the artist’s practice was an interesting part of the exhibition. From early graffiti art as Samo, Basquiat moved very quickly and very young into a successful career as a painter. He channelled a mass of cultural influences into his work from race history to Gray’s Anatomy, Picasso, Michelangelo, jazz, sport. He was prolific and seemed to work straight onto canvas seeing himself as the art equivalent of an improvising jazz musician. I think his work is appealing because he was so direct and so much himself when he made it. It is fascinating but also quite alien. I felt there were few points of connection between Basquiat’s mind and my mind. It was a very odd feeling. There was no photography allowed at Basquiat. In the weeks after seeing these two exhibitions I have frequently thought about the way different artists make art. 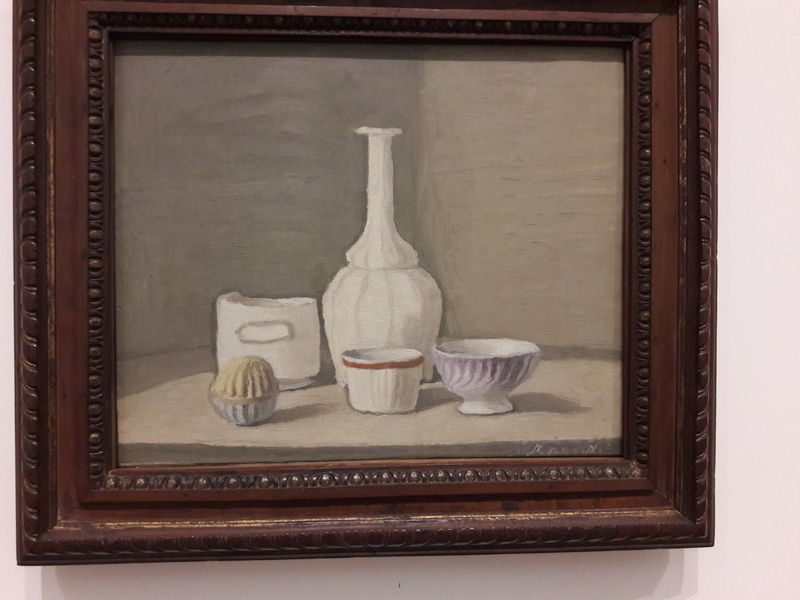 Agnes Martin, Morandi, Bonnard and Basquiat are all artists who have produced important, influential work. But their approaches are so very different. Considered or spontaneous, abstract or representational, symbolic or realistic, political or domestic. I used a photograph as the basis for my drawing of my son. The main reason for this is he won’t keep still. But I thought the photograph also captured an interesting moment where he was just starting to move off the sofa and away. I am interested in the use of photographs as a basis for a drawing. I am aware that there is not much point in copying a photograph so the photograph has to be a starting point for the drawing. Photos also distort what we see and fix it. When we look at something directly and draw it, our eye’s can pick out certain things of interest whereas a photo presents us with everything given equal importance. The interaction is one step removed. In the course of research into using photographs as a basis for drawing I came across a non-academic blog post by Mitchell Albala who is a landscape painter and art teacher. Using Photographs Like an Artist is an interesting look at how to use photographs which features work by artist Terry Furchgott. It is very unusual to see the artist’s source material alongside the final art work so I was very interested in comparing the two. Fig. 3. Terry Furchgott, Woman Reading at Window, 2007, acrylic on paper. Don’t trust photographic values – cameras often create too much contrast between lights and shadows. Make sure your source material has the information you need. The use of photographs comes under fire in Are Painters’ ‘Reference Photographs’ a Form of Cheating? a Huffington Post article from 2015. Finally a blog post on Redbubble by a poster called Blythart who is based in Blyth, United Kingdom. This features some lovely comparisons of photographs and final artworks by artists such as Picasso and Van Gogh which show how using photographs as source material can leave the door open for artistic expression and interpretation. I really enjoyed looking into how artists use photographs in their work. I recently watched a BBC4 documentary about Augustus John which said he made his children sit for hours while he painted them. If only he had had a camera, they might have looked happier. The Tate features a picture of his son Robin where the gallery label says: “Robin’s consciousness of being scrutinised by his father could be interpreted as betraying resentment or unease. The two had a difficult relationship. Robin’s silences often infuriated John, who declared his son ‘hardly utters a word and radiates hostility’.” Maybe by not having a camera, John revealed his feelings for his child in a way a painting from a photograph would not.